The opening shot, flashback to 1974, sets up the villain Dr. Sivano (Strong) He’s an abused child who becomes involved in a car crash with his father and brother. Before the crash we see his father verbally abusing him and belittling him. 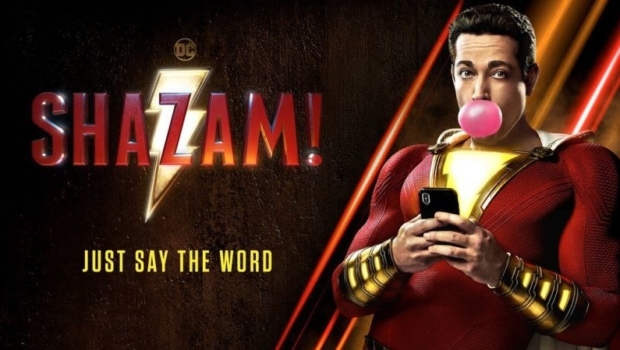 During the crash he is transported to another realm where he meets the ancient wizard Shazam (Hounsou) who informs the young Sivano that he is seeking someone to take over his role, someone who is pure of heart. But we discover that Sivano isn’t the one, so he’s transported back to the scene of the accident. We then jump to the present day where Billy Batson is searching for his birth mother. He’s a bitter child who has been bounced around from foster home to foster home through the years. He winds up with the Vazquez’s who are a racially diverse family of foster kids that try to make Billy feel welcome. Darla, played adorably by Faithe Hermon, is a hugger who immediately runs up to their new “brother” and hugs him. But Billy is standoffish and just wants to be left alone. Slowly, as his new family begins to help him, even to the point of finding his birth mother, he warms up to the fact that this is his family. Especially when his birth mother (Keisha T. Fraser) turns out to be less than excited about meeting her son, whom she abandoned years ago. The brother that Billy warms up to the most is Freddy Freeman, a crippled boy who is about Billy’s age. Meanwhile Dr. Sivano discovers how to return to the Rock of Eternity and take command of the seven deadly sins. The old wizard is to weak to stop him and now the seven sins posses the good Dr. and he destroys the realm. In an act of desperation, the wizard finds Billy and grants him the powers of the heroes Solomon, Hercules, Atlas, Zeus, Achilles, and Mercury. 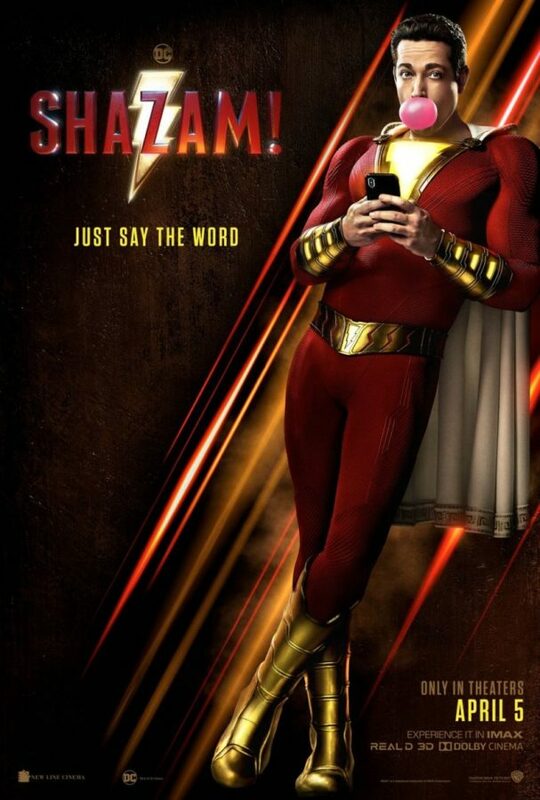 When Billy says the name of the wizard, Shazam, he turns into the superhero known of as the big red cheese. He must learn how to use his super powers with the help of Freddy and then the battle begins as Dr. Sivano wants the wizard’s staff, now in Billy’s possession. This is the most fun DCEU movie ever made. The actors all turn in great performances and the direction and pacing are on par making it an enjoyable ride from start to finish. The script and editing, however, could have used more polish. Although Mark Strong makes a formidable villain, we never get the feeling of his Sivano being the arch-nemesis to our hero. He’s simply there to be the bad guy. Even though the movie sets his character up at the beginning. We fail to see any emotion tied to his past. We should get the feeling that this is a lost child in need of therapy that never came. The sympathetic arc that could make us relate to the character never happens, hence his appearances don’t jolt the audience into hoping that the villain is defeated but rehabilitated never shines forth as it should have in the script. He becomes one dimensional in his attempt to regain the wizard’s staff. We also don’t fully understand why he wants the staff to begin with, since he already has super powers in relation to his being possessed by the seven deadly sins. My personal guess is that he wants powers without the aid of the demons, but this is never revealed in the movie. Hence, we’re left wondering what his obsession with the staff is. Leaving these scenes kind of bland. One clever bit of casting has John Glover playing Sivano’s father. Glover played the father of Lex Luthor on Smallville. Why this is a fun fact is the lawsuit from years ago when DC (National Periodicals back then) sued Fawcett (the original publisher of Captain Marvel/Shazam) for copyright infringement stated that their character was to close to Superman. One of the reasons for this was because they imitated every aspect of the character, right down to having a bald scientist as Shazam’s arch-nemesis (Luthor, vs. Sivano) And I’m sure the people casting this movie knew about that, which is why Glover was cast. I love little touches, or Easter eggs, like that in my movies.